How To Translate Large e-Commerce Websites Effectively? In the past, website translation process would involve a lot of manual work and getting developers and designers involved. Now we can say that translating websites and e-commerce stores has never been easier. You have dozens of language service providers and at least three approaches to choose from. If it’s all so spectacular, then why is it that e-commerce translation is one of the most neglected (even e-commerce giants use Google Translate)? Our guess is that e-commerce stores can be significantly larger and have more content than ‘regular’ company websites, so the translations have fewer chances of being perfect. An example? A small website has around 500 subpages and a medium e-commerce store can have a few thousands of subpages. As a person responsible for the global success of your e-commerce business, you probably know the pain of planning for product updates, new product launches and keeping everything localized up-to-date and in place, in order to really respond to your international customers’ needs. In this business, it’s either make it or break it and we know that localization of such large projects takes time. However, while a lot of people would tell you that it is not possible to eat a cookie and have it, we’d say that it’s definitely possible, you just need to have the right tools. That’s why below you can find examples of what to really look for in an advanced translation platform to be sure that your large e-commerce localization will not be a pain in the code and you will be able to really eat the cookie and have it. Do you want to start translating your e-commerce immediately? No problem! Make sure you pick the language service provider where you can create your translation project on the go, with just a few pages. This kind of feature guarantees that the rest of the scan is performed fully in the background. The best part? You can get onto other important stuff without waiting and you’ll simply get notified when it’s finished. 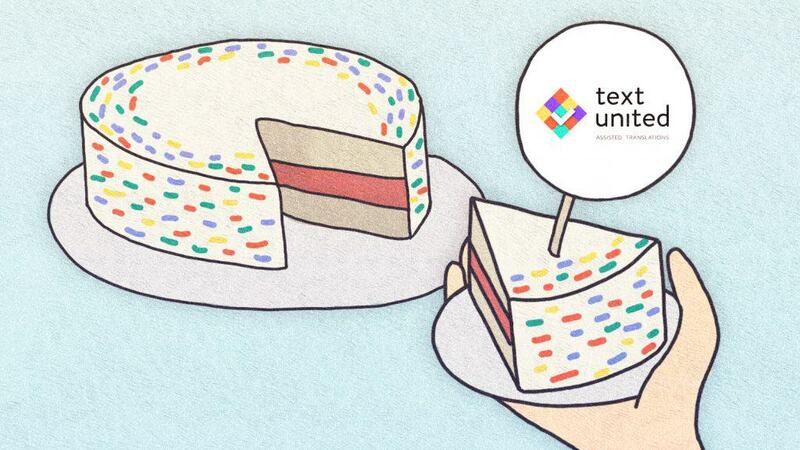 How does it work at Text United? – Start scanning the website. You can leave the project setup wizard, you’ll get a notification with the scan results, from where you can continue to create the website translation project and choose consecutive pages. 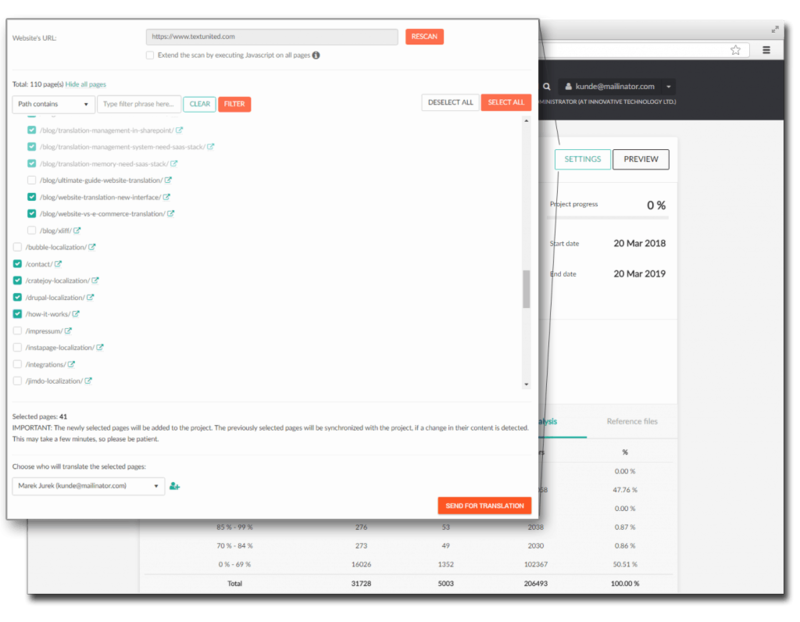 – Results of scanning websites are saved – after crawling is complete, the user will receive scan results in his inbox, and this list will also be available in the project settings. – The scan results in the inbox contain a list of all pages that have been crawled. – The user can stop the crawler at any moment in the scan process and select pages for translation that have been scanned so far, and create a project. New pages can be added afterwards, at any time. If you have a large e-commerce store, you’ll know that frequent addition of new pages and products is basically ‘business as usual’ situation. As much as it may sound like you are already used to it, it’d be nice to ease the pain by making the process easier. This feature will enable to localize new content and keep the website consistent and up to date in all languages. – From here, the user can add new pages to the project. When you create a translation project, its manager is set as the default translator at the beginning. It’s all nice until you have hundreds of new products to launch and each of them has to be localized. When you look for an LSP, search for the ones where you can change the default settings in a way that allows you to invite new translators to the project, so they work simultaneously on it. Simple, yet genius! – From the project settings, the project manager can change the default translator for the project. I know you read it already a few times, but I promise it’s the last time: e-commerce websites usually contain a lot of data. You may now know how to handle localized product updates and launches, but there is still one problem left: how to start translating a few thousand subsites of e-commerce without going insane or giving up in the middle? The answer is: while searching for a translation platform for your e-commerce, look for “translation in batches” feature. What is it? In short, it’s translating your website ‘part by part’. 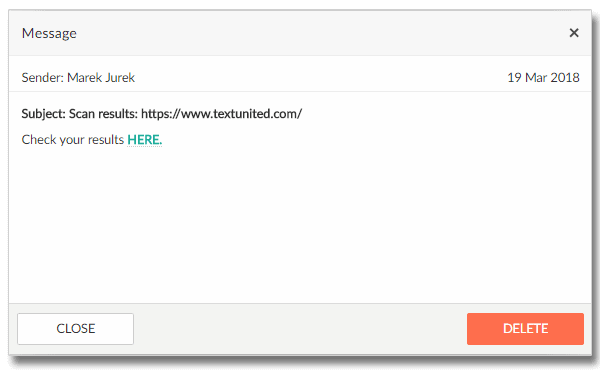 A system with this feature, like Text United, processes the whole website into individual segments. This can take anywhere from a few minutes up to a few hours or more, depending on the size of a website, but you don’t have to really wait for analysis and processing of all the pages. Why? After the first 10 pages have been processed, you can already start working on the translation! Yep, you read it correctly. While the rest of the website is being processed in the background, you already work on the translation. New batches are added automatically in the background (it’s 5 pages per batch) and the analysis keeps updating with each new addition. Like this, when you translate one page, 50 other pages are already being added to the project. E-commerce stores are living entities of the Internet whose content expansion is necessary for their survival and growth. To keep these changes in sync with localized versions of your website, you need to use the feature that enables you to add or change the content on already translated pages. 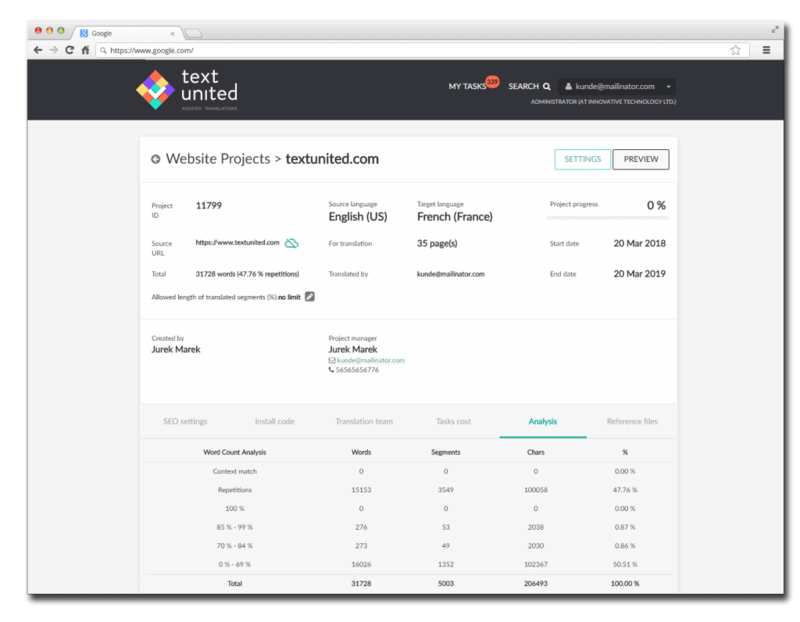 Look for a language service provider that will include that feature in their services, like Text United. When you add new content to your website, you can synchronize it using the above button in the overlay editor. The project will be restarted and analyzed again. Then, new content will be available in the overlay editor as well. Eat a Cookie and Have It – It’s Possible With The Right Language Service Provider!